Test cricket is getting exciting day by day. Isn't it? Australia beats England in the 3rd test to level the series. India tours South Africa and plays 1st test without any practise match and the consequences were clearly seen in the 1st innings where they were bowled out for just 136. South Africa scores a mammoth total and takes a huge lead. Indian batsmen and now found rhythm and batting well but isn't it too late in this 1st test where still two days are left. Out of the massive lead of 484, India stands now at 190 for 2 losing wickets of the openers Sehwag and Gambhir. Pitch looks flat but playing under such a huge lead that too for two more days looks almost impossible. 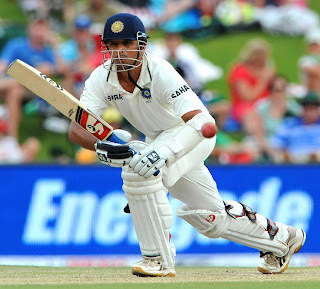 Probably some magical innings from Dravid, Sachin, Laxman or Dhoni may save the match or probably some heavy rain. The only thing that hampered India here was lack of practise matches and 1st innings dismal performance. Otherwise batting line up is still strong to withhold South African attack. Stay tuned for the exciting proceedings of India Vs South Africa Day 4.